Door knockers have been in use for centuries, from elaborate Georgian designs of Grecian goddesses to lion heads and more simple ring designs. Their popularity only waned with the introduction of the electric doorbell. The knocker’s material and finish is key to identifying the period it belongs to: black-painted cast iron was common in early Georgian era, but was then gradually replaced largely by brass – burnished and unpolished in the latter Georgian period and then highly polished and shiny in the Victorian era. In terms of sourcing a door knocker for a period home, you have two options: buy original, reclaimed pieces or go for replicas. Reclaimed pieces are more likely to be unique (and are likely to cost a bit more as a result, with very ornate Victorian designs going for £100 or more), but there's nothing wrong with getting a replica, so long as it's made using traditional manufacturing techniques. Door knockers look best mounted centrally, at head height, on a muntin. If the addition of a knocker isn’t enough to revive a tired old front door, then consider restoring your front door – or choose a new front door. Georgian door knocker are all about ornate design and an unlacquered, burnished finish. This Solid Brass Lion with Ring Door Knocker is a fine specimen of Georgian-style door furniture, without the heavy price tag of an original piece. The style of this solid brass Aged Nickel Knocker from Willow and Stone became popular in the early 1800s and is perfect for a door with slimmer panels. The elongated shape is perfect if you want to recreate an authentic Regency look. If you live in a Victorian property, your door will likely suit a heavier, black cast iron piece. The Kirpatrick Fox Door Knocker is as authentic as it gets, made using a malleable iron casting technique (which makes the iron less brittle) that was developed in the 1850s. The ornate and elaborate pieces that characterise the Georgian and Victorian periods gave way to simpler, more abstract designs in the late-Victorian and Edwardian eras. The Melton Door Knocker in Antique Brass from Jim Lawrence will complement any home, but especially the restrained red brick design and painted door of an Edwardian semi. Live in a cottage nestled among lovely greenery? A nature-inspired door knocker will help you complete the exterior look of your property. The Bright Chrome Hedgehog Door Knocker from Black Country Metal Works has our vote – so pretty and well-made. Want a more contemporary twist on a door knocker? You can't go wrong with a ring design. Originally popularised during the Victorian era, it will fit into almost any period home exterior design scheme. 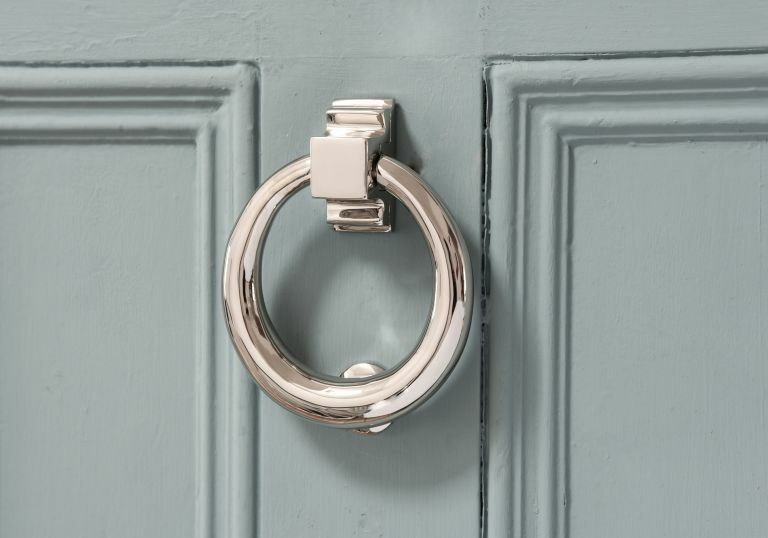 Our pick is the Ring Door Knocker in Polished Brass from John Lewis & Partners.